For nearly two years we have talked about sharing, and answering questions, about how we work together, both personally and professionally. Now that we are about to throw a little one into the mix we feel this conversation is even more pertinent than ever. We love receiving your emails with personal questions but, unfortunately, aren’t always able to answer every question that comes our way. Overall the majority of your questions have focused on how to work with someone you love and have a deep emotional connection to, all while maintaining a life that doesn’t feel consumed by work or isn’t detrimental to the emotional connection you have built over the years. This conversation isn’t just about married couple or dating couples, it extends to families or close friends who also work together. To us, this entire conversation is about how to work with someone you also share life with. Which is both the most exciting and scariest thing you could do. Your questions over the years have meant a lot to us, and hopefully, our answers along the way have been helpful. But for a long time, we have been trying to figure out how to make this personal conversation we have had with many of you, a more public conversation. We are a couple years into this adventure of owning a business together, and we feel like we have a grasp of what it means to run a business together and also understand there is much more to learn. To give you a little backstory, Mike and I met in college. I was his TA in a design class, and we ended up working together on a couple of large projects our senior year. After many late nights in the studio, eight months dating, a year engagement and graduation, we got married. We graduated from a small liberal arts college in the middle of the 2009 recession and just wanted to create. At the time, creative jobs were nearly impossible to find, but with a lot of hustle and a bit of luck, Mike got a job as a junior designer at a boutique agency making almost nothing, and I was able to keep enough of my freelance clients from college to keep me busy. In our first year together, we had no money, but we did have a little 600sqft rental house with a view of Lake Michigan, a huge garden we could eat from, and dreams of the world ahead. I had a freelance base, but most of my projects were production design jobs. Nothing all that inspiring. Which led me to start this blog. I was looking for a way to express myself creatively, outside of my paid design work. In the beginning, I took any and all design work. I designed wedding invites, print material for small financial companies, Indy movie posters for production houses in LA, and so on. I was quickly learning just how difficult it is to run a small freelance business with no room for mistakes. Mike, on the other hand, had moved on to a bigger agency and was feeling the weight of that environment. It wasn’t long before he and a friend had built up enough freelance clients on the side to leave their agency and strike out on their own. At the same time, my freelance business, and this blog, were really starting to become something. I was beginning to realize just how much blogging meant to me. For about two years, Mike and I worked nonstop but rarely together. Mike and his creative partner were doing really well, but they were traveling all the time, which left us very divided in life. I spent a lot of time creating alone with long work hours running the blog and studio. It was fun, but I was beginning to see more inquiries for design work than I could handle. I felt I needed someone. At the same time, Mike’s company was working on some really high-profile projects with some big paydays ahead. Which was exciting, especially after not having a savings account for a couple of years, but his role required him to be in a suit presenting to a boardroom more than designing on a computer. Which he really was great at, but I could tell, wasn’t going to fulfill him. I, on the other hand, was overwhelmed with incredible design projects but was struggling to make any money. I am terrible at invoicing and asking to be paid. For the earliest days of our marriage, we said we would never work together, for the sake of our marriage. But at that moment, not working together was driving us apart more than it was bringing us together. We were in separate worlds, and neither of us were thriving. It was in early 2013 when I got an inquiry to go to Paris for four weeks and shoot and design an educational program. The job didn’t pay, but it covered all expenses. At that point, all of Mike’s projects were in development, and I was free to travel. So we went. We weren’t making any money, but it was our first chance to go to Paris together. Mike had studied art history in Paris in college, but we had never been together. From the moment we walked out of the subway and sat down for breakfast at a cafe, everything changed. For the first time in years, we didn’t have cell service, client calls, or daily responsibilities. We spent the whole time together, creating and exploring. Before long, we were seeing how the last few years of working in our own worlds had been good for our individual strengths and weaknesses. By the time we left, we knew we were going to work together. That was the beginning of our journey together. There have been massive ups and downs along the way. We have had real fights, days of not speaking, and some tears. In those moments we learned so much about what it means to grow a business, be creative entrepreneurs, make a living, communicate with one another, and most importantly preserve our relationship. We have watched many creative couples build amazing businesses together, and we have seen just as many have their business tear them apart. There is no doubt the challenge of building a business with the person you love is a challenge, but it is one of the most rewarding experiences in life. The decision to work together shouldn’t be taken lightly, and not every couple should work together. There is real risk in making these leaps and many times you can feel alone in the pursuit. But we want to remind those of you in the journey that you are not alone. We are all in this together and we are right here with you in it. Which is why we are starting this series and cannot wait to see where it goes over the coming months. We also thought it would be a great series to continue while we take some time away from the blog to bring our little guy into the world. We have some topics already outlined, but we would love to answer some of your personal questions. We will be covering some basics topics we have received a lot of questions about in the past, but we really do want to address some of your personal questions you send us directly. 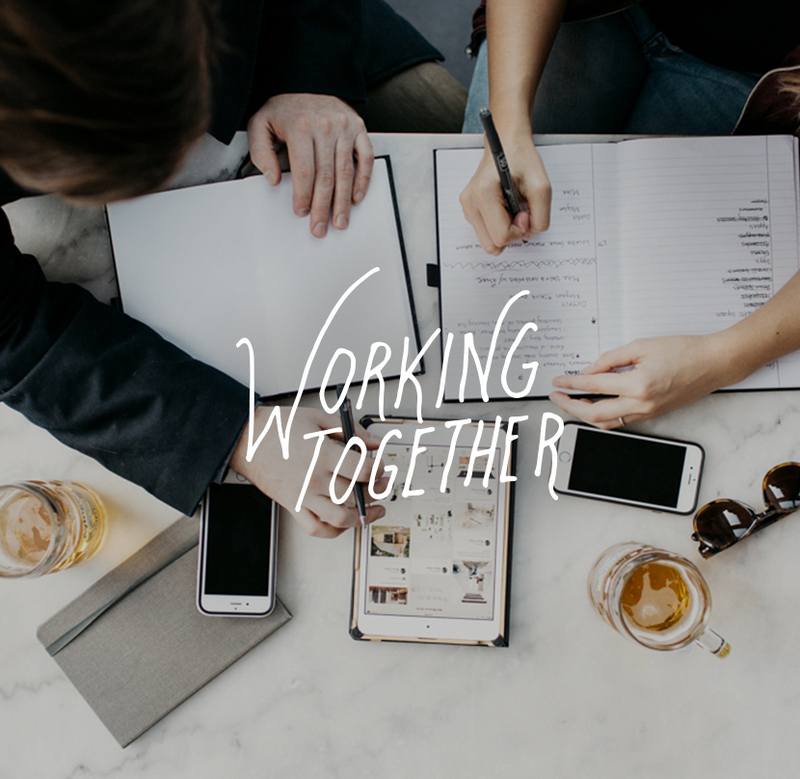 If you have a question PLEASE send it into us at [email protected] with the subject line “Working Together Series” and also please let us know whether you are comfortable with your name being released or not. You can leave us a comment as well if you have some general topics or issues you would love us to focus on. We know some questions may be more personal and may not be something you want to be shared on the blog but we want to hear it all. It can be questions about Mike, Me, our story, or struggles together. It can be business questions about structuring paperwork, bank accounts, and more. It can be very specific questions about your own situation, and it can be more abstract. We are open to any questions you guys have. We will be watching for your emails and comments. We are excited to hear your thoughts and more! This is such a great idea for a new series and I am really curious to read more about how you both work together. While I do think that couples who work together are very blessed and hope that my next partner is as supportive of my online career (and of course I supportive of whatever career he has! ), I am sure that it is not always roses and comes with it’s own fair share of difficulties as well. REally looking forward to hearing more from this series! This sounds like such a fun and informative series! I love your story, and that you’re so open and honest when it comes to sharing the good and the bad. You and Mike have an amazing creative synerGy, and i can’t wait to hear more about How you balance everything. Oh the struggle is so real! It would be cool to interview you guys at some point once we get further into the series. We love following your journey and you guys know the realities so well of what it means to work with your other half. Thanks so much for commenting Jeff! Give Kelly a high-five for us! Keep making magical things together. Thanks for sharing! I have been searching for this type of article as my husband and I have finally decided to stop only talking about it and are in the process of starting our business together. I’ve jumped around to several contract jobs that haven’t worked out and he’s also been unhappy with his last few on-site contracts. I look forward to following your story and reading through your other posts as I’ve just come across your blog! I would love to hear some of the questions you ask clients to start the creative process. What questions help you understand what they’re really looking for, and how do you keep the flow of communication open throughout the design process? THANK YOU! We will add it into our upcoming episodes.